5,200 sq. ft. of existing space renovation. DesignTech coordinated with separately contracted studio lighting designer, broadcast cabling designer, site/civil engineer, and acoustical engineer as well as the Client and Owner. 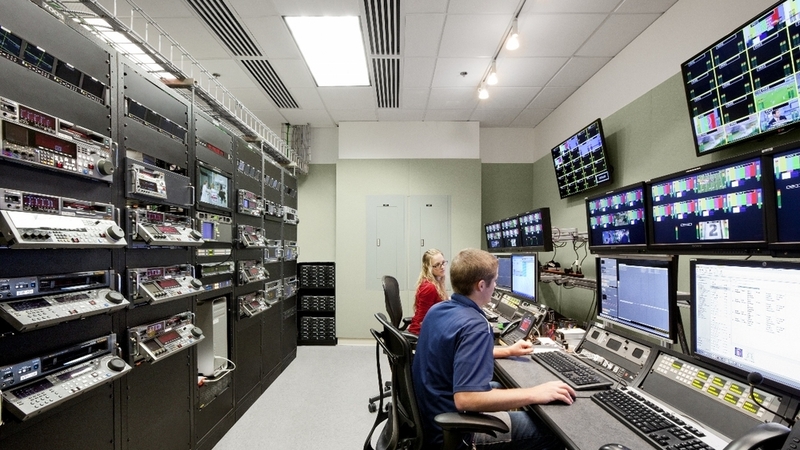 Providing new supplemental RTUs for each of the two expanded studios. Reworking ductwork to suit new layout. Incorporating new equipment into BAS. Modifying conference room and adjacent area to suit new loading dock installation. Replacing two rooftop units serving existing studio. Modifying power distribution system to accommodate the new studio lighting and HVAC loads. Coordination with Architect, Owner and broadcast integrator to specify cable tray system for broadcast cabling. Coordination with Architect, Owner and set lighting vendor/designer to specify installation of studio dimming system and branch circuit wiring from dimmers to connector strips at lighting grid. Design installation of new work lights for studio.